Home » Greenroom » AED: Does Your Workplace REALLY Need One? AED: Does Your Workplace REALLY Need One? Safety should always be on top of everyone’s mind in the workplace. Productivity and efficiency should be achieved without sacrificing anyone’s health and wellbeing. This is why any place of work should be properly equipped with the right tools for providing first aid. One tool that could really save lives is an AED or an Automated External Defibrillator. 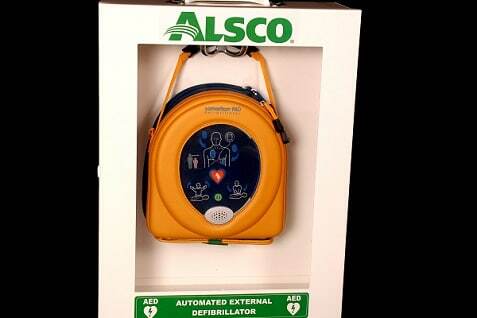 Alsco can provide your workplace with Automated External Defibrillators and other related services. Their high service standards, great quality products and incomparable prices have made them one of the most trusted in the field. Get in touch now so you can have access to high quality AEDs all the time. Take advantage of Alsco’s flexible pricing options now. An Automated External Defibrillator or AED is a portable device that can be used for treating heart conditions such as cardiac arrhythmias of ventricular fibrillation. It can determine if defibrillation is needed by a patient and deliver a shock if required. The heart is electrically active, but sometimes the electrical signals that are needed for the heart to function normally get disrupted and that can affect its ability to pump blood. In ventricular fibrillation, the electrical activity of the heart becomes problematic, which disables the ventricle from circulating blood. If this goes on, the condition will worsen to asystole, which is a condition where there is no electrical activity in the heart. An AED could no longer be used in such a condition. Why is AED Treatment Needed Immediately? If a condition reaches asystole, the only chance of the patient to survive is a combination of treatments using CPR and drugs, which can help bring back a rhythm where the AED can be used. When these conditions are left untreated, they could lead to cardiac arrest, which means that the heart stops beating altogether. Cardiac arrest that is left untreated for several minutes could lead to brain damage, which is irreversible and death. For every minute that a patient is in cardiac arrest without being treated, the chances of survival go down by 7% during the first three minutes and that worsen to 10% after the first three minutes. As you can see, it is very important that an AED be accessible to be used on any patient suffering from cardiac conditions within the first few minutes. A lot of people are confused with SCA or sudden cardiac arrests and heart attacks, thinking that those two conditions are the same. SCA happens when the heart stops beating because of problems concerning the electrical signals. A heart attack on the other occurs when something blocks the blood flow, which will cause a portion of the heart muscle to die. Heart attacks can lead to SCA, but the latter can occur on its own without warning. Because time is crucial in getting these two conditions treated, it would help to know the difference and how to properly identify each condition. Elderly people are at higher risk of suffering from SCA, but it can affect anyone. This is why having the right tools and skills required for first aid are essential in any workplace. Does your workplace have the right first aid tools? Alsco does a free audit to determine WHS compliance of a workplace. Get yours done today. AEDs are designed to be used by laymen. Ideally, the users should have received some training in using the device, but people who have no training at all were able to use it in the past and save lives. Studies have shown that the presence of AED is an effective lifesaver for those suffering from cardiac arrhythmia. Metals in the torso area of the patient should be removed first before defibrillation in order to avoid interference. Those metal pieces include piercings and bras with metal underwire. AEDs are generally carried by emergency medical personnel who respond to medical emergencies. They are trained in using the devices. Ambulances usually have AEDs and their crews are trained with their use. The problem is that cardiac arrhythmia requires immediate treatment because every second matters. This is why it would help if you have an Automated External Defibrillator in the workplace and employees are trained or at least informed on how to use the device. You should get your AEDs from sources that can be trusted such as Alsco, to ensure that you will have a device that would work when it matters. Though an AED delivers shocks to the bodies of the patient, it is safe and the patient would not be injured by it. These devices are designed only to defibrillate a rhythm that is shockable. The steps for using an AED are very simple and straightforward. People with no training in using AEDs have been able to use the devices and save lives. During a case of cardiac arrhythmia, CPR should be performed right away. When the AED is available, the pads should be connected to the chest of the patient immediately. Some people are wondering if CPR is still necessary when there is an AED available. CPR is still needed because it does something different from the device. CPR allows the blood to continue circulating to the heart and to the brain and prevents irreversible damage because of the lack of blood flow. Performing CPR on a patient also increases the chance that defibrillation would work. Another common thing that lay persons are wondering about using AEDs is whether it can accidentally shock them or other responders. These devices are very safe. The shocks are supposed to go from one pad to another, passing through the chest of the patient. Still, it is required that safety precautions should be followed when using the device. Asking others to stand clear and checking the area to make sure that it is safe to use the device are a must when using the device. Medication patches on the chest of a patient should be removed first and the skin cleaned dry, before applying the pads of the defibrillator. The defibrillator patches should not be placed directly on top of medication patches. There is no need to remove the patches of the defibrillator if you have to perform CPR again on the patient. The patches should stay in place until emergency medical responders arrive and takeover in caring for the patient. The patches should be placed in the right way so they would not be in the way when performing CPR. The chest of the patient should be exposed. In case of a woman patient, the bra should be removed. It is okay to use an AED on a wet or a metal surface. The important thing is to follow safety precautions when using the device and that the chest of the patient should be kept dry. Another thing that might bother laypersons is whether it is safe to use an AED on someone who has a pacemaker or a pregnant woman. Those are valid concerns, but the simple fact is that the use of an AED should not be withheld from someone suffering from SCA. In case the patient is a child, a paediatric pad should be used, which would carry a lower charge. Having an AED is a must for every workplace. It could mean saving the life of a person. You can never be too sure about these types of devices, so you have to get them from a trusted source, like Alsco. They can perform a free audit of your workplace to check WHS compliance, to tell you if you need other first aid tools other than an AED. Get in touch with Alsco and find out more about their Automated External Defibrillators and the unmatched service and care that comes with it.